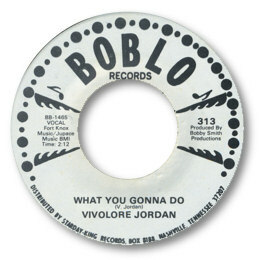 Vivilore Jordan seemed to have different spellings of her name on her various 45s – but the impact of her strong, confident singing was impressive whatever the name on the disc. All her releases were Gerogia based and so that state may well have been her home. Her first 45 Maybe was a real cracker, a dead slow ballad that gets stuck in the mind. 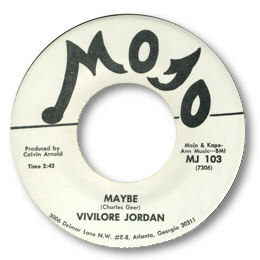 Further proof that Calvin Arnold never made a bad record on his Mojo label. But What You Gonna Do for Bobby Smith’s Boblo was even better. A really venomous vocal from Vivilore was matched by a very big horn section and some tasteful wah wah guitar, underpinned by a steady organ. This performance is really up there with the great malevolent soul songs – should be much more highly rated. 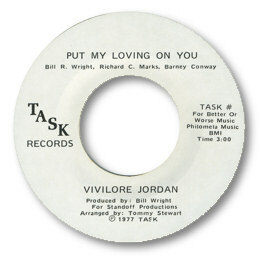 Her final sessions for Tommy Stewart and Bill Wright in Atlanta include the modern soul spin “Put My Loving On You” which fetches very high prices. But I prefer the more melodic and measured Pickin’ Up Where She Left Off with it’s subtle chord structure, excellent background voices and tastefully arranged horns. NOTE ~ Serena Johnson did a very good version of "All Work And No Play" for Big 2.